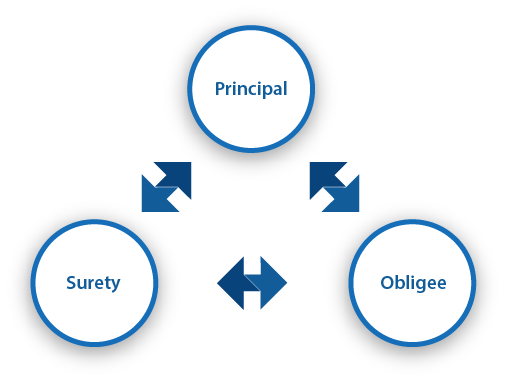 While there are many different varieties, a surety bond is simply an agreement between three parties: Principal, Surety and Obligee. The surety provides a financial guarantee to the obligee (i.e. government) that the principal (business owner) will fulfill their obligations. Therefore, a surety bond is a risk transfer mechanism. A principal’s “obligations” could mean complying with state laws and regulations pertaining to a specific business license, or meetings the terms of a construction contract. If the principal fails to meet their agreed upon obligations with the obligee, the surety may be required to resolve the dispute by paying a claim to the obligee. It is in this sense that a surety bond is similar to a form of credit extended to the principal by the surety. OBLIGEE: Government entity or person requiring principal to be bonded. SURETY: Provides financial guarantee to obligee on behalf of principal. As a bonded principal, you must take every action possible to avoid claims. Claim activity may happen in the process of conducting business, whether valid or invalid, but it is ultimately the responsibility of the principal to make sure the disputes are resolved prior to the surety paying out on a claim. Before becoming bonded, you will be required to sign a indemnity agreement with the surety company where you must agree to pay the surety back if they have to pay a claim due a violation by your company. The surety is only extending you credit, and therefore will expect to be reimbursed if a valid claim is paid. Having a paid surety claim may make it very difficult for you to become bonded again in the future, as it is a standard question on all bond applications, and is usually a cause for declination. To understand what a surety bond is, it’s helpful to know what it is not. A false misconception is that a surety bond is insurance for your business. This is not true. Instead, bonds are more like insurance for the public , or your customers, that you are required to pay for. Consider surety bonds a cost of doing business with the U.S. government. Most businesses are also required to have some sort of separate business general liability coverage that protects their business from routine perils and losses. It’s important to understand that difference between the two to make sure you have the right type of coverage for your business. Surety Bonds Without the Hassle.